If you want an upmarket alternative to mainstream large family cars, the new seven-seater BMW 2 Series Diesel Gran Tourer is an interesting proposition. It’s even bigger than the already sizeable 2 Series Active Tourer and can boast a huge amount of practicality for a (relatively) affordable price tag. It’s also impressive to drive and well equipped. OSV takes a closer look at what it’s all about with our 2018 BMW 2 Series Diesel Gran Tourer review. Despite being much bigger than the MINI Cooper Hatchback, the BMW has lifted its engines from its sibling. However, they’ve been given an injection of power and, as a bonus, sharing its engines with such an entertaining car means the BMW has plenty of character of its own. The added power ensures the 2 Series Gran Tourer feels faster than you might expect. Moreover, it doesn’t drive like a typically cumbersome people carrier. Instead, it drives a lot like a BMW should. That said, you need to keep your expectations slightly in check as this car won’t take bends with as much dexterity and confidence as a 3 Series. Drivers need to be a bit more cautious, but they’ll happy with the fact that it steers and handles just as well as anything else in this class – if not more so. This fact is even more satisfying when you consider that this is only the brands second ever front-wheel-drive model. In terms of its engines, the entry-level 1.5-litre diesel is probably the one we’d suggest you overlook if your budget stretches further. Hauling around a fully-loaded seven-seater was never going to be easy for an engine that develops just 116bhp, and so it’s proved. 0-62 is dispensed within 11.4 seconds, which might be too slow for some of you. A bigger 2.0-litre diesel that powers the 218d is a much better bet. It’s refined and smooth, even at speed, and doesn’t make as much noise as you’d think. Rounding off the range is the 220d model. It gets the same 2.0-litre diesel engine as the 218d but with extra power, and it also benefits from xDrive four-wheel-drive. However, we largely think this engine is unnecessary. It covers the 0-62 sprint in just 7.8 seconds but that seems at odds with the family-friendly nature of the car. If you’re planning to spend a lot of time off the beaten track, by all means, take a closer look at the 220d model. Otherwise, the 218d model will do all you need it to. Inside, there are few things – if any – to complain about. Compared to mainstream rivals, the BMW commands a high asking price, but one look inside will tell you it’s worth it. As ever, the German brand has mixed solid build quality with style and pizzazz to create a luxurious cabin that might tempt buyers who were otherwise considering a Ford. As ever, the brand’s iDrive system is present and correct, and as ever it’s the best in the business. Its 6.5” screen looks fantastic and its ease of use is one of its standout features. The dashboard itself is classically BMW – great to look at, well-finished and driver-focused. All the buttons are of a high quality and everything is easy to use. Brush metals and high-gloss inserts help to give it a touch of class. 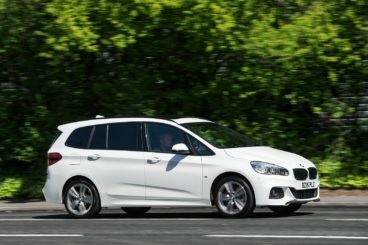 Is the BMW 2 Series Diesel Gran Tourer practical? It offers more space than the smaller Active Tourer and fares well against its rivals. It boasts an extra third row of seats, although these are probably going to be too small for adults. The second row of seats come with a tilt-and-slide function that makes it easy to access the third row, while the big rear doors make it easy to access all rows. Storage space is good and includes a generous glovebox, while headroom is good for all and shoulder room is adequate. Perhaps what will be frustrating for some buyers is that seats are different sizes. The boot, meanwhile, measures 145-litres when all seven seats are up. Fold all seats and you have a total load capacity of 1,820-litres. 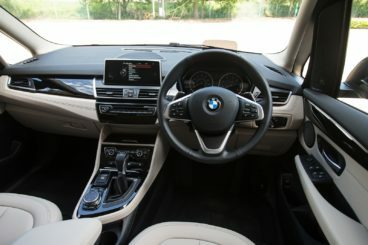 Standard kit is good across the range, with all models getting the iDrive system, BMW’s Emergency Call system, a digital radio, rear parking sensors, automatic dual-zone climate control and sat nav. The Luxury model adds a unique 17” alloy wheel design, exclusive leather upholstery and classy wood finish on the dash. In terms of how safe the car is, its excellent build quality was surely one of the reasons Euro NCAP awarded it all five stars for its crash test. Its standard safety kit includes traction control, electronic stability control and lots of airbags. Optional safety kit includes Active Cruise Control, parking assist and a reversing camera. In terms of its running costs, the diesels benefit from the fuel-saving technology that’s already been in use in the MINI. The 1.5-litre engine makes a strong case for itself with returns of 68.9mpg and it emits just 108g/km of CO2. Adding four-wheel-drive, however, will have a significant impact on those figures. The 2.0-litre diesel engine is available in two power guises, with the smallest of the two able to return as much as 64.2mpg economy. The bigger of the two is good for 57.6mpg and emits 129g/km of CO2. Insurance-wise, the car falls between groups 10 and 21. It’s a well-made car that’s durable, robust and ready to stand up to the rigours of family life. It’s a front-wheel-drive, seven-seater BMW so it’s never going to be among the brands most entertaining cars, but it’s assured, competent and on the whole good to drive. It fares well when compared to mainstream rivals on this front. Its ungainly shape isn’t exactly classically BMW. There are certainly cheaper rivals available. Let’s see how the car fares against its rivals in the comparison section of our 2018 BMW 2 Series Diesel Gran Tourer review. The new SEAT Alhambra Diesel Estate is a seven-seater that’s pretty damn huge. Like BMW, SEAT are known for producing cars that are fun to drive. But surely they couldn’t pull it off with what is essentially a people carrier? Amazingly, they have, and the Alhambra handles more like a Hatchback. It’s entertaining and comfortable, and can boast well-weighted, precise steering. Body lean is kept to a minimum, and thanks to the sheer amount of grip that’s on offer it always feels safe. Sure, there are cars that are a bit more fun – but only slightly. Firm suspension is indeed the only thing that we have an issue with, but if you pay £950 for adaptive dampers you can even solve this problem. In terms of the engines, a 2.0-litre TDI diesel is available in two separate guises. The smaller 148bhp variant is a bit on the slow side but it will save you a few quid at the pumps. Performance, moreover, is decent and it’s got just about enough to cope with the car on a full load. If you can afford it, though, we’d recommend going for the bigger 182bhp variant. It’s got more punch and copes even better on a full load. However, it isn’t available with the entry-level trim. Running costs? The smaller of the two diesels returns 56.5mpg if you stick to the entry level trim and pair it up with a 6-speed manual ‘box. Opt for a more expensive trim and that number can change to around 55.4mpg. The bigger diesel, meanwhile, is good for 53.3mpg economy and emits 139g/km of CO2. Inside, the firm suspension setup could have lead to an uncomfortable ride. Fortunately, it hasn’t and the Alhambra irons out bumpy surfaces well. Insulation is better if you stick to the smaller wheels, and it’s easy for the driver to find the right position, thanks to lots of adjustability. The dashboard is very much no-nonsense, and there are lots of soft-touch plastics in use. Overall, it’s an excellent cabin. 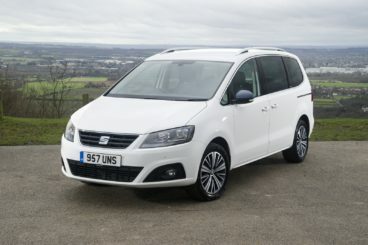 Is the SEAT Alhambra Diesel Estate practical? It’s one of the most usable cars on the market right now. It’s spacious, functional and offers a very flexible seating layout. Combined with the sliding side doors, the seating layout makes access super easy. Three full-size individual seats make up the second row, head and legroom are fine, while the boot measures 276-litres with all the seats up. Fold the second and third row, and you can extend this to a whopping 2,297-litres. 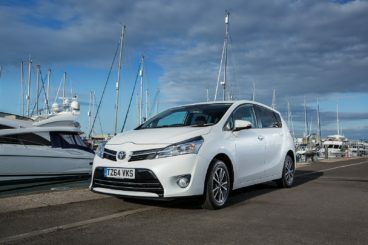 The new Toyota Verso Diesel Estate is practical, simple to drive and offers frugal running costs. It’s also cheaper than the BMW. The Verso is competent enough, and if you need a spacious MPV to carry you and your family around without any hassle, it’s well worth a test drive. However, it’s not much fun and won’t excite you like the BMW will. A somewhat stiff suspension setup helps to prevent the body from swaying in bends and it hasn’t dented comfort. In terms of its engines, just the one diesel is available. It’s a 1.6-litre turbo unit that’s a bit cranky when you first fire it up, and at lower revs it tends to run out of puff. It’s noisy too, it vibrates … but it is the best Verso engine on offer and it copes well with the car on a full load. Running costs? The diesel is good for returns of a 62.3mpg economy and emits 119g/km of CO2. This means it’s cheaper than the 2.0-litre diesel it replaced, but it’s nowhere near as powerful as the BMW. Inside, Toyota has made the Verso as hassle-free as possible. This means the steering wheel and seats get lots of adjustability, the dashboard is easy to operate and build quality is good. It looks and feels like a car that will stand up to family life on the road. Is the Toyota Verso Diesel Estate practical? The seating system is super versatile, and you can arrange your seats in 32 different ways. If you buy the basic model you’ll get just the five seats, but the rest of the range gets a third row which easily folds into the boot floor when it isn’t needed. Storage spaces include a pair of glove boxes, a few door pockets and some useful cup holders, but the boot measures just 155-litres when all seven seats are up. Fold the third row increases it to 440-litres, while folding the third and second row increases it to 1,696-litres. Want a seven-seater that has badge appeal? It will be hard to look past this one. It’s never easy to make a desirable seven-seater but BMW has almost pulled it off. We say almost because it’s hardly the most stylish car in town. But what the BMW 2 Series Diesel Gran Tourer can offer is drivability, space, excellent build quality, a plush interior and low running costs.